As I mentioned yesterday, The Nerd’s favorite breakfast food in cinnamon rolls. I think if I would let him, he’d eat a dozen at a time by himself. I’ve always wanted to try the Pioneer Woman’s recipe for cinnamon rolls, but having 40-50 cinnamon rolls in my house is not a temptation I want hanging around. So, I found another great recipe and adapted it to suit our tastes. These cinnamon rolls are extremely rich and decadent… it’s like having dessert for breakfast! Combine the buttermilk, egg and oil in a small bowl, then set aside. In the bowl of a stand mixer with the paddle attachment, mix together water, yeast and 1 Tbsp of the granulated sugar. Whisk and let sit for 5 minutes. When the mixture looks bubbly and frothy, pour in remaining sugar and salt. Mix on low for 15-20 seconds. Add buttermilk mixture and mix until combined. Switch to the dough hook and add 2 cups of flour into mixer. Then mix on low until incorporated. Sprinkle flour into the mixer 1/4 cup at a time, mixing until dough forms a ball and no longer sticks to the sides of the bowl. The dough should be sticky, but not sticky enough to stick to your hands when touched. Turn mixer on medium-high and knead for 5 minutes. Remove dough from bowl, grease with butter and replace back into mixing bowl. Cover with plastic wrap and a dish towel. Rise for 1-2 hours or until dough has doubled in size. Grease two 8×8 pans with nonstick baking spray. Stir brown sugar, cinnamon and cornstarch together in a bowl until combined. Set aside. Flour a large clean table and rolling pin. Roll dough out to be a 20×30 rectangle, while moving dough around to ensure it’s not sticking to the table. Spread 1/4 c butter on the dough, being sure to go over the entire surface. Go right to the edges, leaving a 1-inch strip untouched on on the edges of dough. Evenly sprinkle the brown sugar mixture onto the top of the brown sugar layer. Roll the dough up into a tight log; sealing the edges with a little water and your finger. Cut log into 2 inch slices. Place in two greased 8×8 pans, leaving room for dough to rise/spread. Cover pans with plastic wrap and dish towels. Refrigerate overnight. In the morning, preheat oven to 350°F. Bake for 20-25 minutes, or until tops start to brown. Be sure to watch them so they don’t burn! Meanwhile, whisk together the frosting ingredients. The frosting should be thin enough to pour, but still pretty thick. Add milk to reach the desired consistency if needed. 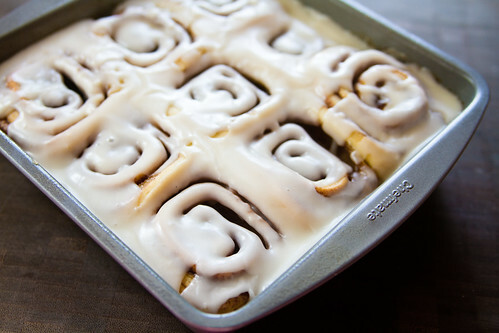 When the cinnamon rolls are done, remove from oven and pour frosting over them immediately. 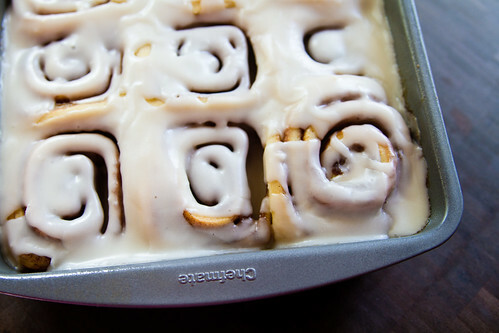 Be sure to get down in the cracks and crevices of the cinnamon rolls. Serve warm.